Admit it: you want to play Iron Man’s Tony Stark, manipulating amazing inventions and taking over the world. June 2014, you’ll have your chance. 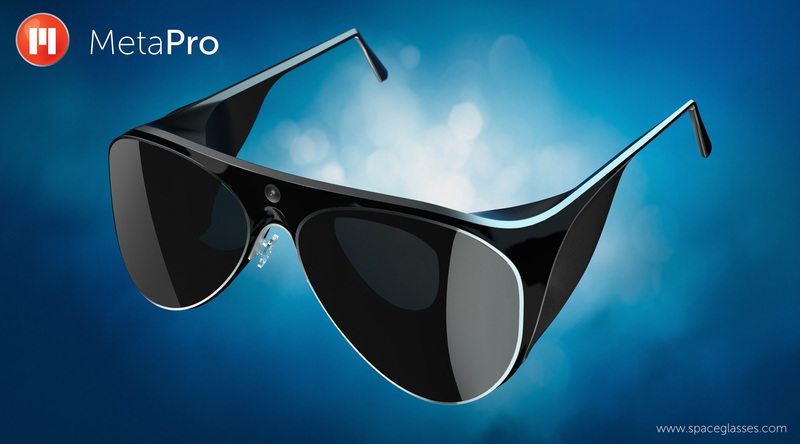 That’s when Meta’s aviator-style MetaPro “holographic” glasses — a consumer version of the $667 Meta 1 developer version* — will ship. Meta is taking pre-orders now for this pricey but powerful $3,000 gadget. It will have 1280×720 pixels for both displays and 40 degrees field of view, with 2mm optics aligned for stereo depth vision. Included in the glasses frame will be a 3D depth sensor, twin RGB cameras, 9-axis integrated motion unit, accelerometer, gyroscope, and compass — all of which translate into awesome 3D video games and other apps Meta says it has more than 500 in development. A bucket on your head vs. aviator glasses? “The Meta is a natural machine, which uses the things that have evolved to manipulate our environment, namely, our hands. You reach out and you manipulate holograms,” Gribetz said. The legendary Steve Mann (remember the Paris “attack on a cyborg”? ), who invented the first augmented reality device in 1978, is also on board as chief scientist. Exactly how would MetaPro compare to what Tony Stark could do in Iron Man? “Aside from [Stark not using] a head-mounted display, the difference would not be noticeable, assuming a powerful computer were driving it,” Gribetz said. Granted, the MetaPro won’t have such a computer. Who wants to drag around a supercomputer or can afford one? But it will have the most powerful commercially available wearable pocket computer, he claimed. With these specs, it will indeed rival laptops: an i5 CPU, GPU (for fast graphics), 4GB RAM, and 128GB solid state drive, plus Wi-Fi 802.11n and Bluetooth 4.0. Want. * Meta.01 was announced in August. The concept video is below.